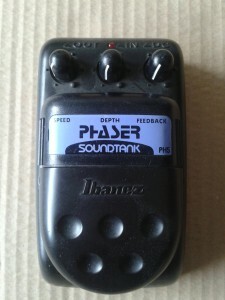 Ibanez PH5 Phaser from the Soundtank series. 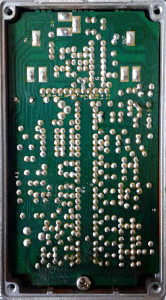 Made in taiwan around 1996. I’ll admit it. I love phasers. Don’t use them much (or at all) on my standard pedal board, but i always have a couple of differently voiced ones with me when i’m in studio. 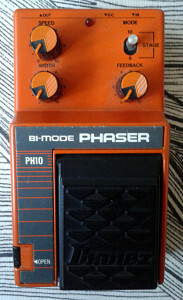 Some phasers are bad, while some can really improve your tone. This one sinks easily into the latter category. 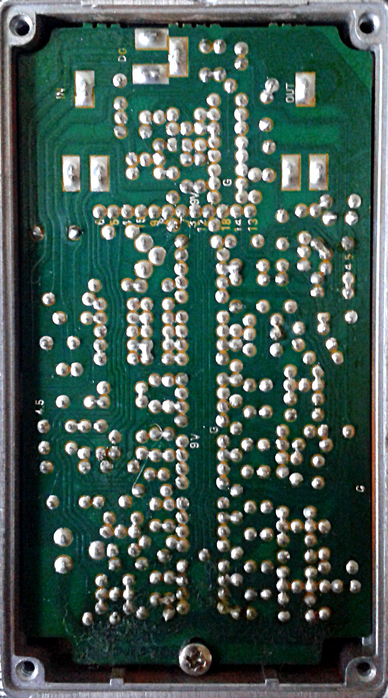 Opening this puppy up shows oldschool acidy corners on the traces, which always make me feel warm and fuzzy. 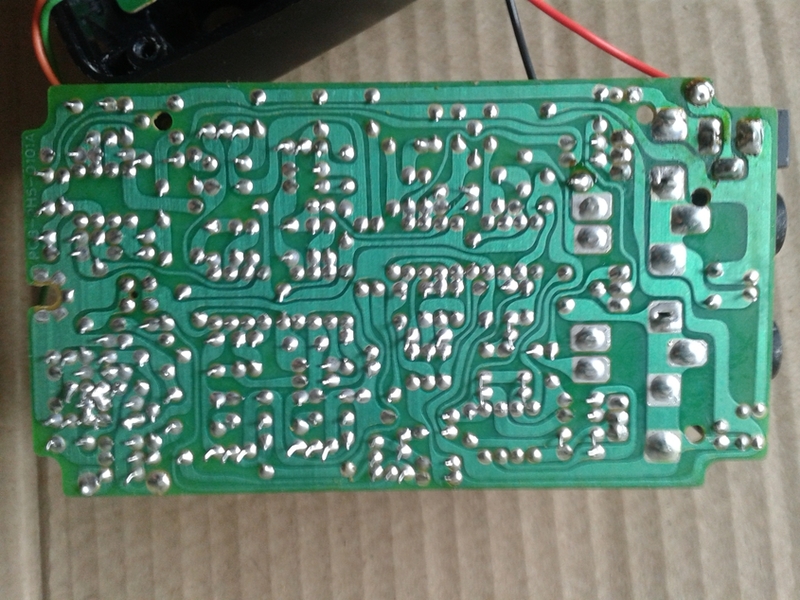 As i couldn’t find a reasonable schematic floating around, i’m going to assume couple of things by just looking at the component side of the board. 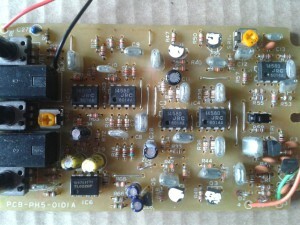 To me this looks like a four stage design with JRC1458s acting as LFOs and single TL022 taking care of the mixing. Some folks on forums were talking about this being quite close to the PT9, which may very well be true. 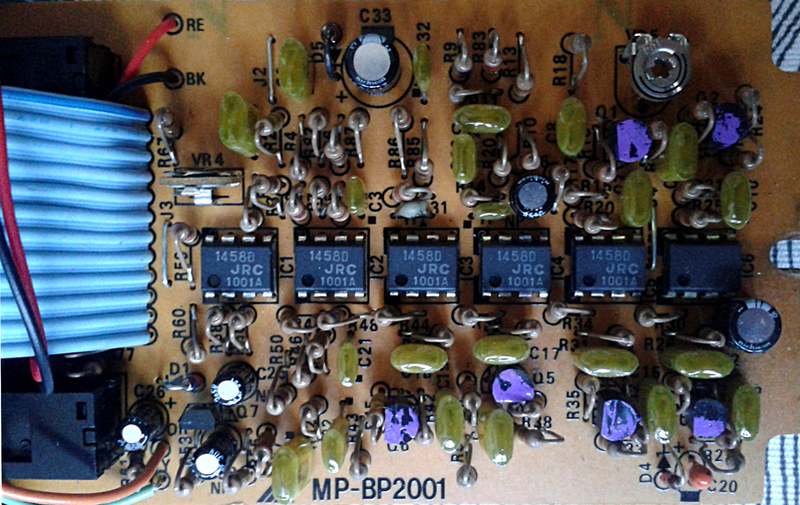 If you get a chance to read the schematic for this, the phasing JFET biasing should not be overlooked. Forum folks say that it’s unconventional. With just three controls, this is quite versatile phaser. Speed and Depth act as they should and the Feedback control can take this thing in to space. Bad swithing, as is natural for the series, but simply swapping it makes this run happily again. I do have couple of other phasers in my collection, but it seems that i take this one with me a lot. Soft and powerful. From slow and mild to fast, vibe-like and swirly wild. 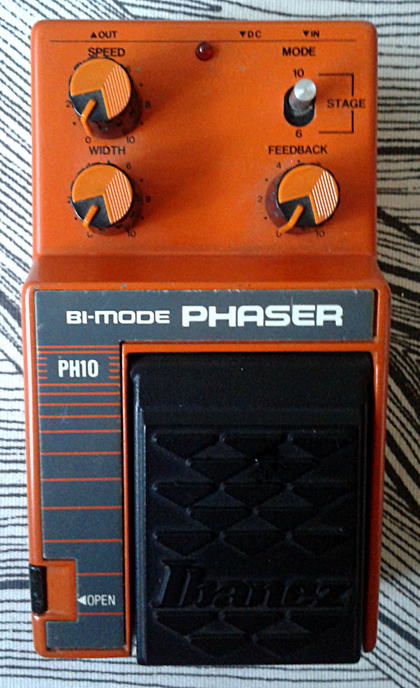 Despite the near-standard Phase90-style circuitry, this is versatile phaser that sounds quite natural. 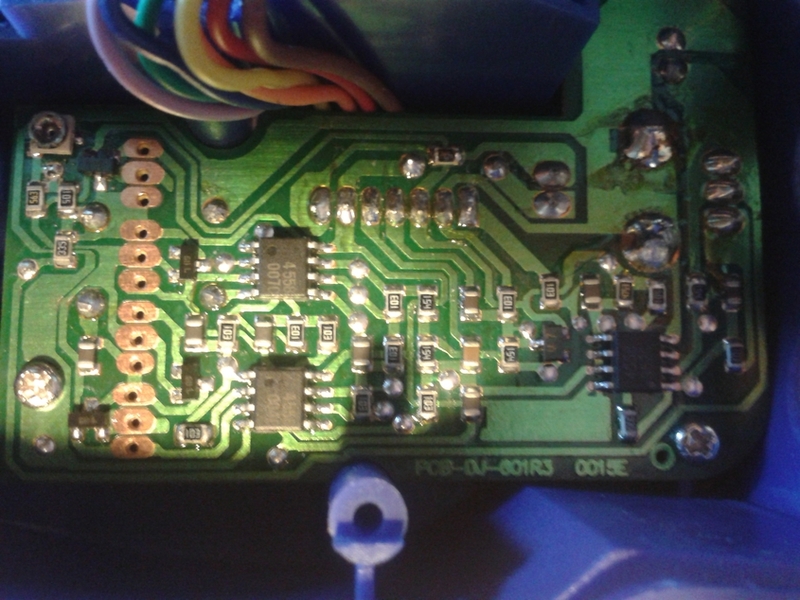 Biasing sounds on point and accurate as there are no “broken” parts on the phasing sweep. 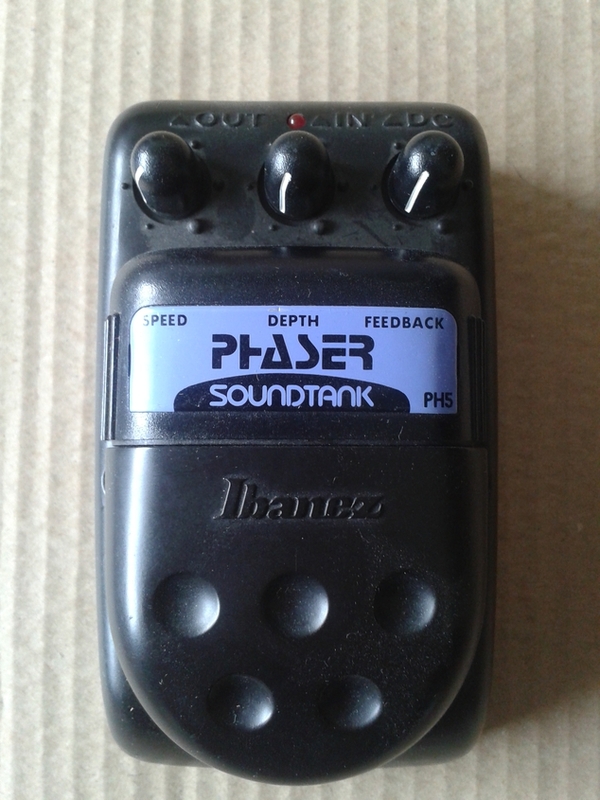 Really nice sounding design which makes this one of the best sounding phaser tools i know. 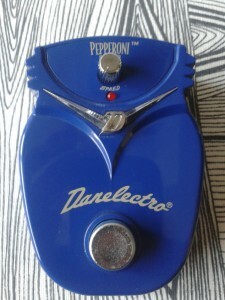 Danelectro DJ-6 Pepperoni Phaser from the Dano Mini series. Standard mini plasticky box. Bought it for cheap and now that i have it – i can say that no-one should pay good money for this. Mine came in as horribly misbiased, so i needes to tweak it quite a bit to get it running as it should. Although i’m not using a lot of pahsers, i tend to like them. Which leads to me having a few. The schematic is posted at Experimentalists Anonymous, and it shows the design to be very similar to Phase90 and many other four stage phasers. 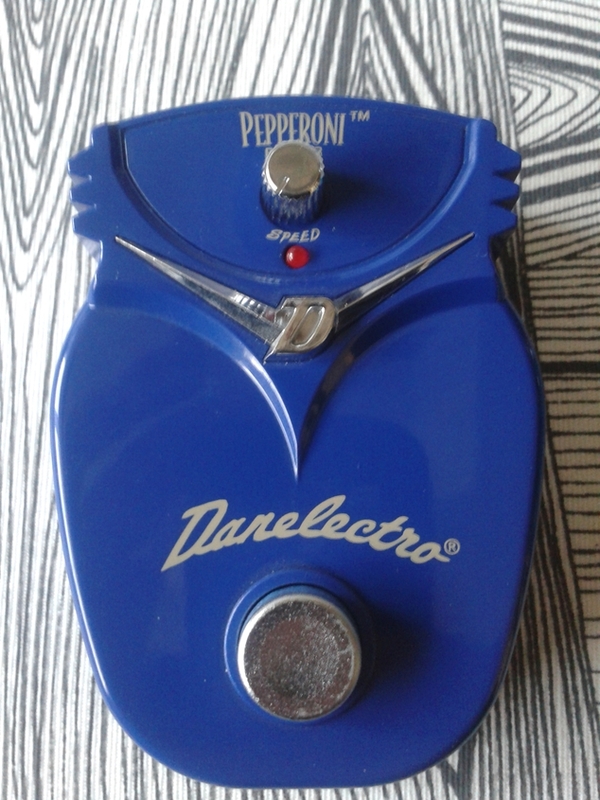 Accompanied with your standard Danelectro electronic switching, the build quality seems ok, if not better than average minis. Note the empty pads. 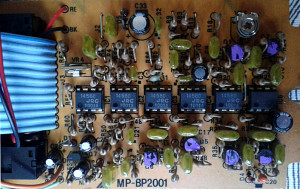 Those are for through-hole JFETs. I enjoy running into such curiosity. Definitely something that i didn’t expect to see. In general the layout, all SMD construction and everything else is on par with mini other series boxes. Could be a nice, small footprint alternative to Phase 90. Assuming you can get one of these for next to nothing. Otherwise it may not be worth the trouble. Not too good, but to my ears the overall sound is better than current reproduction versions of MXR Phase90, which is very overrated phaser. The bias trimmer may need adjustment, as for my unit the setting was off enough to kill the whole signal on certain parts of the sweep. To get it just right, the trimmer needs to be turned very, very carefully. 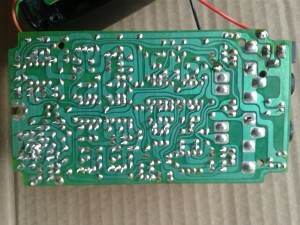 I do suspect that the SMD JFETs are not as perfect match for each other as they should be. 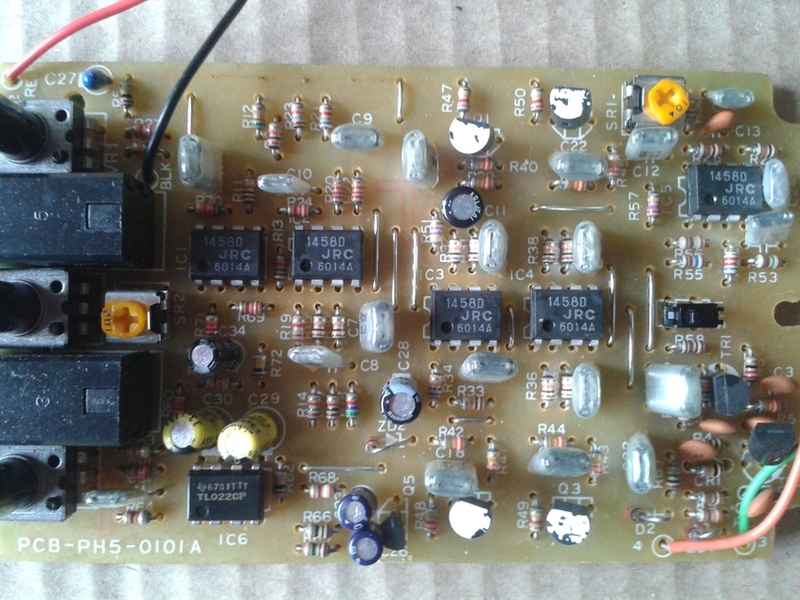 So taking a use of empty pads and using your own matched quartet of JFETs could be a nice improvement. Entries (RSS) and Comments (RSS). 36 queries in 0.139 seconds.